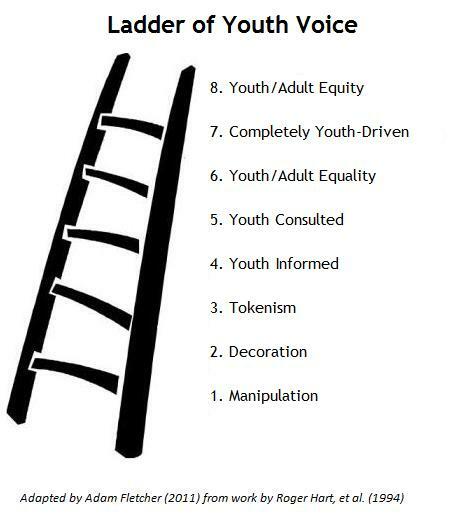 Someone once shared me some details about Roger Hart's Ladder of Young People's Participation. This is quite interesting model that can be used when you are thinking about young engagement. As it is a model that helps categorise and conceptualise where a particular organisation or community group are in engaging with young people. This is great for seeing where young people currently fit in within a group and where and how you would like them to be involved. Of course, we can also apply this to other categories of individuals which can be involved such as the elderly involvement in a group. *Please note that the last three rungs are non-participation by young people. This overall is adapted from Hart, R (1992). Children's Participation from Tokenism to Citzenship. Florence: UNICEF Innocenti Research Centre.